April | 2017 | 50 Westerns From The 50s. There’s a movie memory that’s been bugging me since I was a kid. 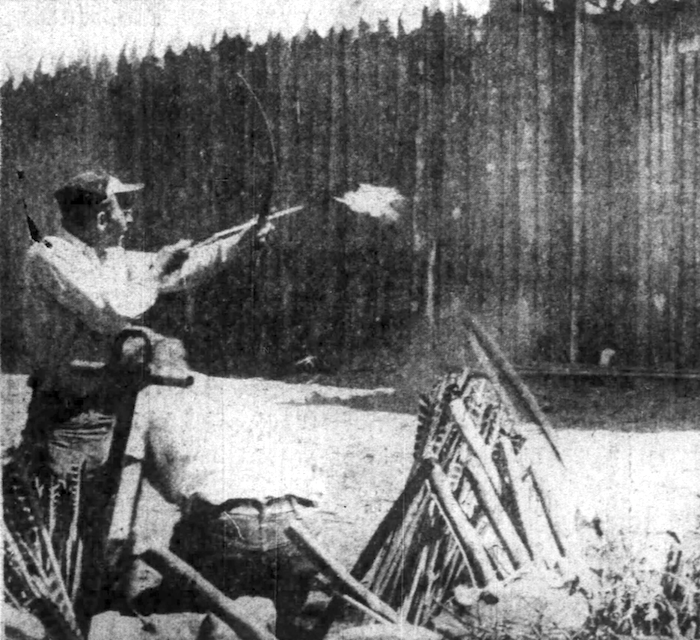 It’s a Western, and John Ireland’s the bad guy — a really bad guy. I remembered a few things about Ireland and the film, but never enough to be able to nail it down. Well, it turns out it was Roughshod (1949), a picture I thought I’d never seen. 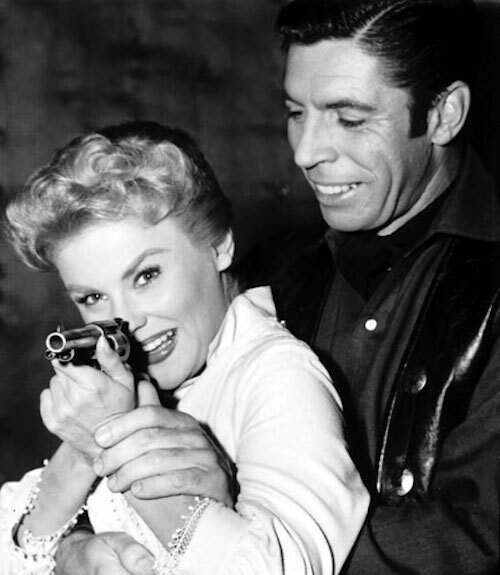 You hear a lot about the noir influence in Westerns — Blood On The Moon and Pursued are good examples. 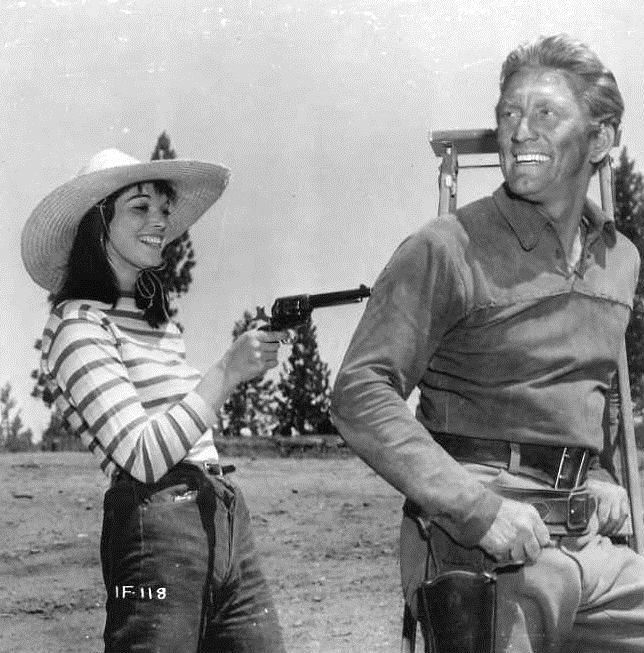 I’d put Roughshod near the top of the list for successfully meshing the noir style within the Western. 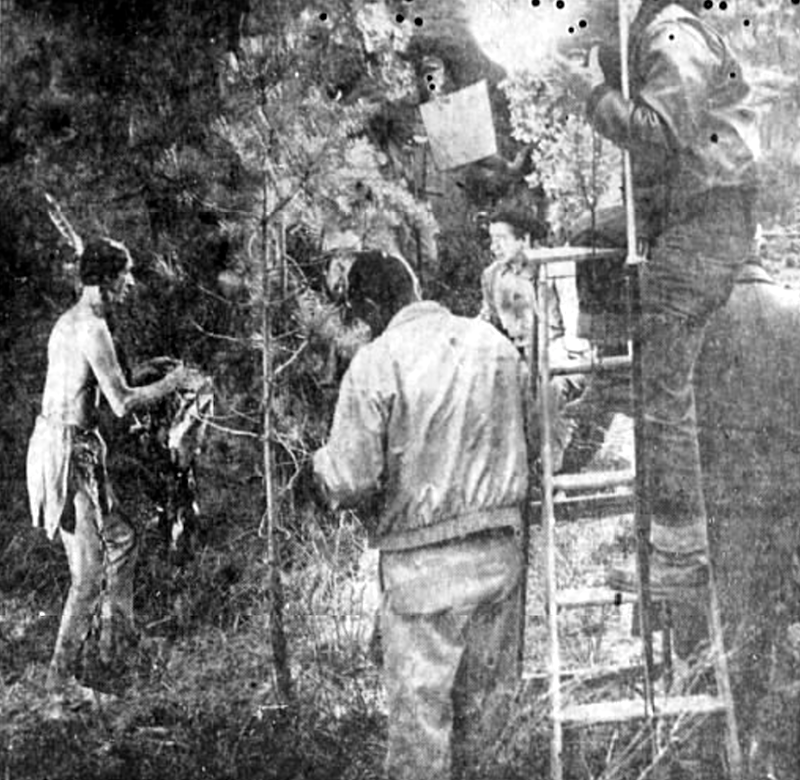 Robert Sterling is Clay Phillips, who’s driving a herd of horses over the Sonora Pass with his kid brother Steve (Claude Jarman Jr.). They happen upon a broken-down buggy and four saloon girls who were headed to Sonora; Clay must be the luckiest cowpoke in history, because the women he’s stumbled upon are Gloria Grahame, Martha Hyer, Myrna Dell and Jeff Donnell. They’ve been run out of Aspen by a group of concerned citizens. 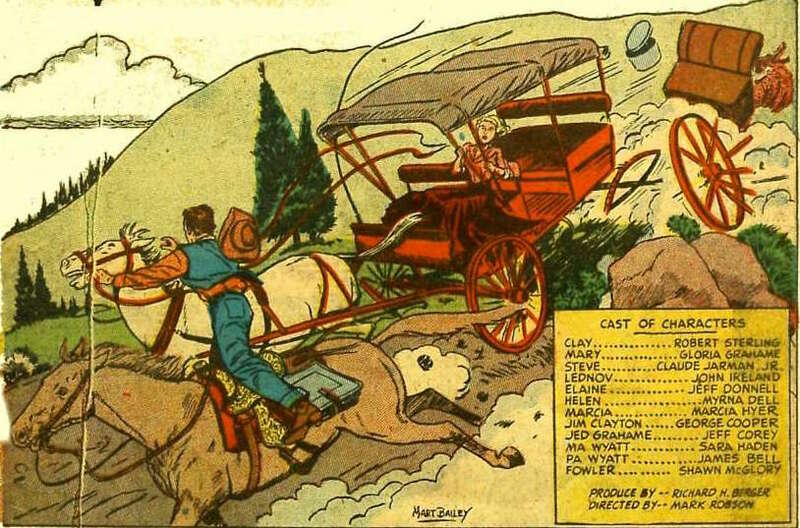 A panel from the Roughshod adaptation in Prize Comics Western. 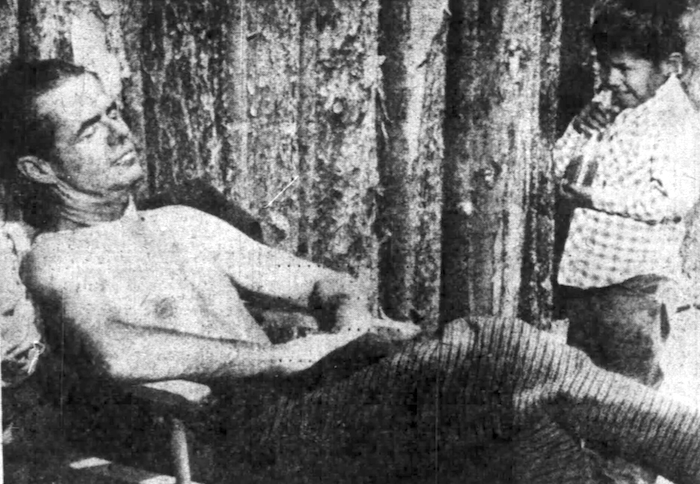 Trouble is, there are three escaped convicts on the loose, and the ringleader is the truly evil Lednov (John Ireland) — who Clay helped send to prison. Lednov would love to bump into Clay out on the trail. The scene that introduces these very bad dudes is the memory I’ve had bouncing around in my head for decades. And revisiting it thanks to the DVD-R from Warner Archive, it’s easy to see why the picture made such an impression on me. This is a dark, tense, terrific movie (and I don’t want to give too much of it away). 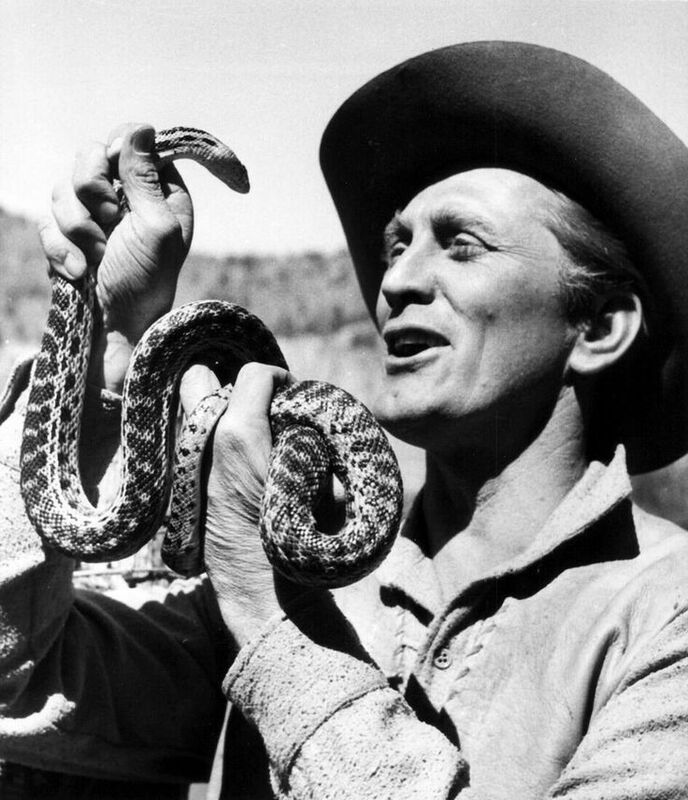 I know very little about Robert Sterling, and he’s fine here. But Gloria Grahame and John Ireland are outstanding. Grahame was great in plenty of things, but she really cooks in this one. The romance that happens along the trail could have been hokey, but she makes it work. It’s a good part, and she really nails it. It would’ve been easy for someone to take the Lednov part way too far (he’s as nasty as nasty gets in a 50s Western), and screwing up the entire movie in the process. John Larch comes close to doing that in another favorite of mine, Quantez (1957). Ireland is so perfect here. Claude Jarman Jr. is good, too. He always was. Mark Robson gets superb performances from his entire cast — everybody brought their A game to this one. Warner Archive has Roughshod looking good. It’s not a full restoration or anything, but it’s nice and sharp and pretty clean — with the picture’s many dark scenes dialed in just right. This might be some of DP Joseph Biroc’s best work. The sound’s nice and crisp. 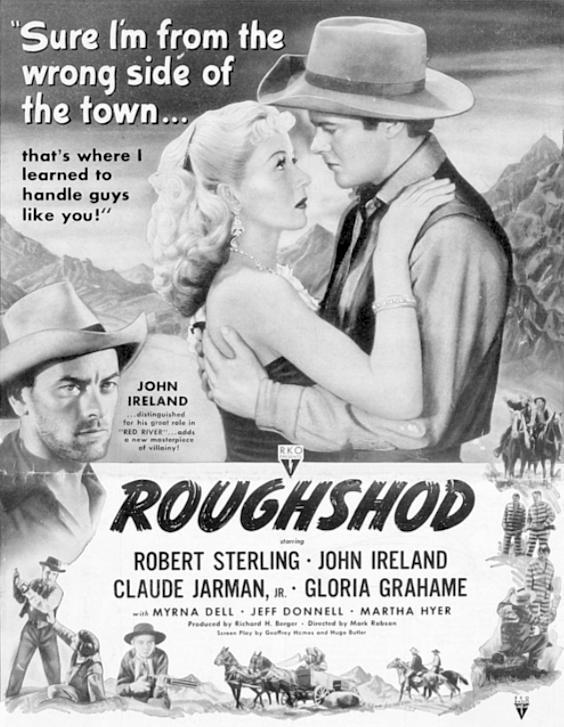 In 50s Westerns, there are so many movies you could say are “ripe for rediscovery.” The fact that Roughshod sits on that list is a real shame. Highly, highly recommended. 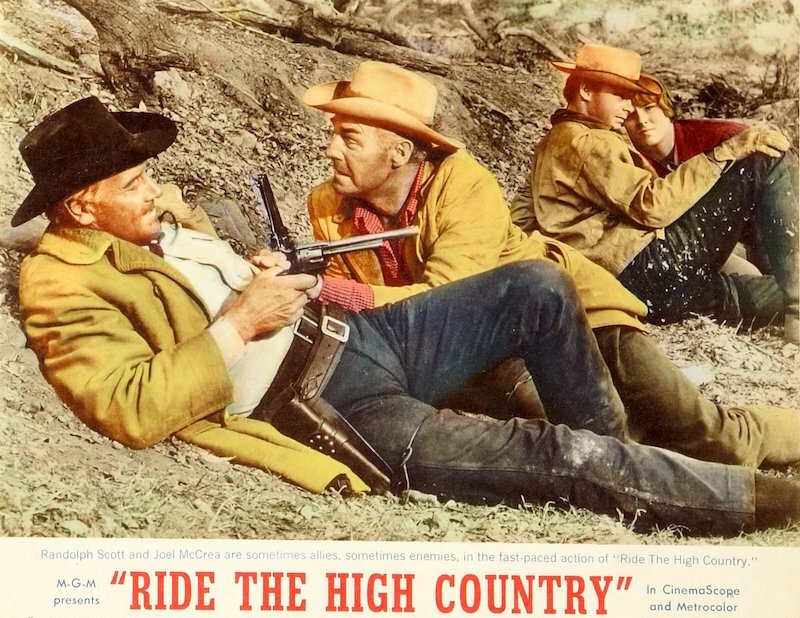 Blu-Ray Review: Ride The High Country (1962). 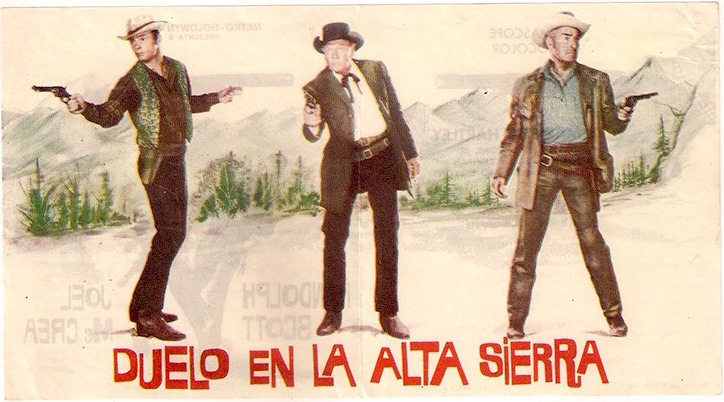 Around this blog, it’s pretty much a given that Ride The High Country (1962) is one of the finest Westerns ever made. There are regulars here who say this is their all-time favorite movie — and it’s easy to see why. There are so many reasons why this thing’s essential. First and foremost, it’s Randolph Scott and Joel McCrea on their way out and Sam Peckinpah on his way in — and all of them turning in some of their best work. 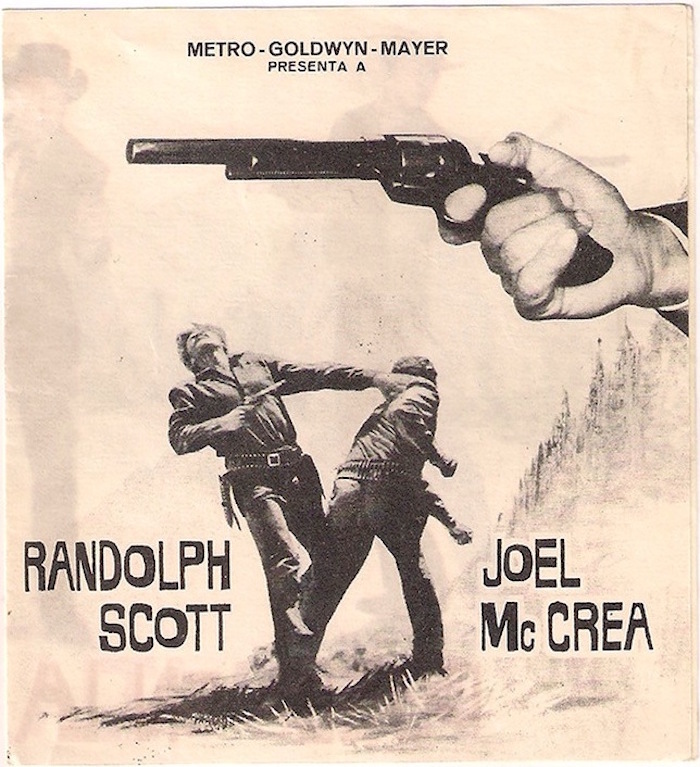 Like John Wayne’s The Shootist (1976), this is a perfect Last Movie for Scott and McCrea (and for Scott it was indeed Last). With Peckinpah, one of the things that make his work so endlessly fascinating is that his major themes and stylistic stuff are evident from Day One. Watching that new set of his The Westerner TV series really drove that home. High Country and The Wild Bunch go so well together, coming at the same themes (outliving your time, sticking to a personal code, etc.) from different angles, but with the same love of the outmoded and the outsider. If you don’t get a little choked up at the end of Ride The High Country, there must be something wrong with you. This one gets me every time. I’m not here to convince you this is a great movie. You probably figured that out a long time ago — without any help from me. But I do think you need the Blu-Ray from Warner Archive. From every wrinkle in our heroes’ faces to Ron Starr’s red shirt to the gorgeous locations (Horseshoe Lake, etc. ), high-definition does Lucien Ballard’s CinemaScope photography proud. It looks like film, which is exactly what it should look like. The increased clarity gives the whole thing a real sense of depth — which has become something I look for in HD transfers these days. Lucky for us all, the extras from the old DVD release have been retained. They’re terrific and well worth your time. And this disc is well worth your investment (or re-investment, in many of our cases). As I said earlier, this one’s essential. 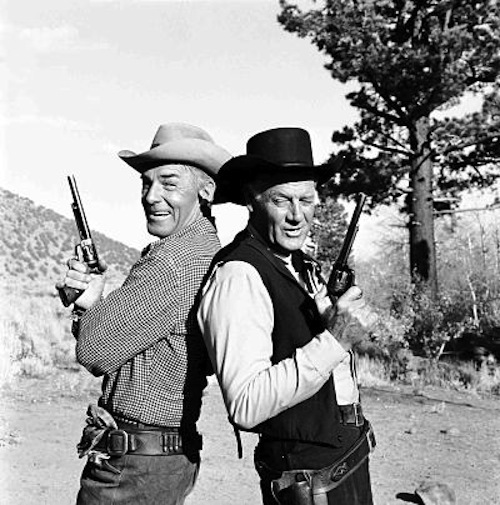 Always wanted to watch this and The Man Who Shot Liberty Valance (1962) together. 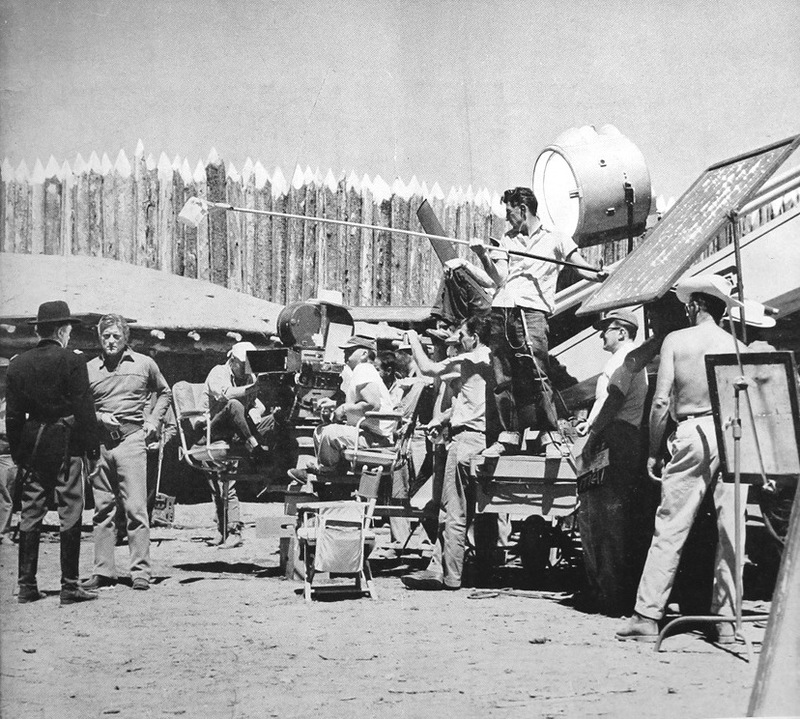 It’d be fun to contrast Ford and Peckinpah’s takes on the end of the West. The images up top are the cover and spread from a handbill or something from Spain. Pretty cool, huh? I have a good feeling about the Dodgers this year. 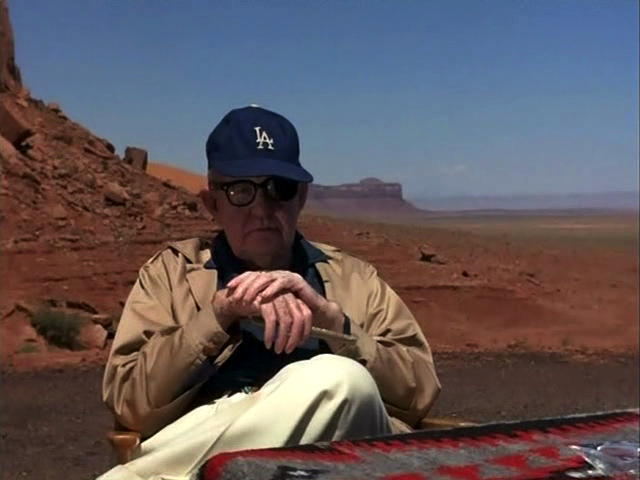 Baseball’s a game with plenty of superstitions, so let’s hope posting this photo of John Ford, his Dodgers cap and Monument Valley does as well for them this year as it did in 2016. Play ball!